If you’d like to learn how to shoot time-lapse with a smartphone, this guide should serve as an introduction and answer any questions you have. Time-lapse photography has never been more accessible than it is right now. In fact, that’s true for any form of photography, because smartphone cameras have seamlessly transitioned from “impractical novelty” to “near DSLR-level” tool in the span of about a decade. Today, the creative possibilities using just the tools available on iOS and Android devices make it possible to craft compelling, mind-bending time-lapse videos, and by the end of this article, you’ll have everything you need to do it. First Thing First: Android or iOS? While both Android devices and Apple’s iPhone have a variety of apps to choose from that can help create stunning time-lapse videos, iOS gets a bit of a leg up with the inclusion of a time-lapse function directly in the native camera app (some newer Android devices do as well, but not all). Of course, compared to many of the dedicated apps available on both platforms–such as the fantastic Lapse It–Apple’s own version is fairly rudimentary. All the same, it’s worth mentioning, especially if you’re just beginning to explore time-lapse work as an art form. Regardless of which side of the smartphone arms race you fall on, there are a ton of fantastic cameras to be had on nearly all of today’s top devices. Chances are, the phone in your pocket is more than enough to get started taking some seriously compelling sequences. The UBeesize Tripod is a mobile imaging platform that can conform and cling to almost any surface, thanks to its flexible, octopus-style legs. 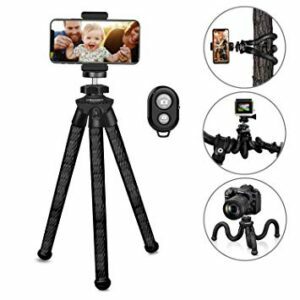 This thing is so good that we consider it to be a must-have for anyone who’s serious about capturing high-quality stationary time-lapse videos with their Android or iOS phone. Try attaching your phone to a guardrail above a busy city street, or to a branch on the side of a mountain overlooking the valley below. The possibilities are limited only by your creativity. Moment has long been the de facto king of mobile lens attachments, and today, their wide range of accessories are more powerful than ever before. Options like the stunning Anamorphic lens give you unparalleled cinematic potential, while the wide angle, telephoto, and macro options unlock entirely new perspectives. If you are trying to blur the lines between what’s possible with a mobile device and what isn’t, this is where you should be looking. If you’re setting out to explore what your phone can really do, we want to give you every advantage you can possibly have. Here are a few tips and tricks we’ve learned and use ourselves every single day. Don’t neglect the basics: Regardless of what devices you use to capture time-lapse videos with, it’s important to keep in mind the essentials like exposure, framing, and subject matter. Each of these represents a crucial pillar that is needed to make your shots interesting to your viewers, which is ideally what you want. Use an older phone if you have one–or don’t: If you have an older device laying around that you don’t use anymore, turning it into a dedicated time-lapse camera may be a great way to breathe new life into it. That said, if you upgraded to a fancy new model that features an even better camera, you may be tempted to justs stick with that, and we don’t blame you. Get creative with your framing: By nature of their size alone, you can get a smartphone into positions and spaces that a bulky DSLR simply wouldn’t be able to go. This is especially true when you couple it with something like the UBeesize Tripod listed above, so get creative and unconventional; you never know where it’ll take you. Experiment with hyperlapse videos: You don’t have to stand still all of the time when capturing your shots. Hyperlapse videos involve camera motion, and apps like Hyperlapse for iOS and Microsoft Hyperlapse for Android make creating these surreal, ghostly sequences easier than ever before. Once more, be sure to check out our guide to 5 of the most essential time-lapse apps for both iPhone and Android phones. Each of these apps will allow you to have more control over the final look of your time-lapse videos, and best of all, most of them are pretty easy to pick up and get creating with them. Now that you have all of the tools you could ever need, there’s only one thing left to do; get out there and start creating!